A seven-year collaboration between one of the nation’s most passionate conservationists, Bass Pro Shops founder Johnny Morris, and three of the most successful golfers in the history of the sport has resulted in the creation of a spectacular new golf course that will now host one of golf’s most beloved events, the Big Cedar Lodge Legends of Golf to be played June 2–8 on the resort’s Par-3 Top of the Rock course, designed by Jack Nicklaus, and the 18-hole Buffalo Ridge Course (formally Branson Creek GC), freshly redesigned by Tom Fazio. This will be the first PGA TOUR-sanctioned event to use a Par-3 Course in official competition. Top of the Rock, a nature-based heritage preserve created by Morris, also features an Arnold Palmer-designed practice facility with 18 target greens and the remarkable 70,000-square-foot “Himalayan” putting course designed by Tom Watson. In addition to Big Cedar Lodge, the State of Missouri, Bass Pro Shops and MasterCard will be sponsors of the tournament. The field will feature two divisions for players age 50–65 and 65 and older. Following Friday and Saturday rounds at Buffalo Ridge and Top of the Rock, all contestants will play at Top of the Rock in the final round. The total purse is $2.75 million. 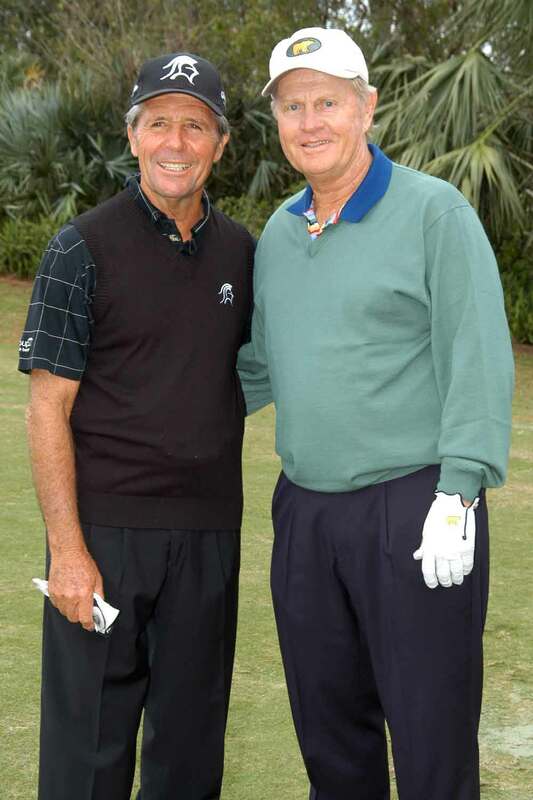 Gary Player will join Nicklaus in the field’s Legends Division. Other competitors are Butch Baird and Al Geiberger; John Bland and Graham Marsh; Jim Colbert and Bob Murphy; Dave Eichelberger and J.C. Snead; David Graham and Tony Jacklin; Charles Coody and Dale Douglass; Allen Doyle and Hubert Green; Bruce Fleisher and Larry Nelson; Mike Hill and Lee Trevino; and Tommy Jacobs and Bobby Nichols. An important and unique component of the Big Cedar Legends tournament is that it will have two pro-am days featuring multiple sporting events including golf, shooting, archery, and fishing with Legends from these sports scheduled to compete as well. Another tradition that Nicklaus regularly partakes in is the Greats of Golf exhibition match at the Champions Tour’s Insperity Invitational. Nicklaus teed it up with Arnold Palmer and Gary Player, known as the “Big Three,” to bring home yet another first-place trophy shooting 11-under par in the 2014 event, held in May. It was the Golden Bear’s third consecutive appearance in the match-play event. Nicklaus won 10 times on the Champions Tour during his storied career—then known as the Senior PGA Tour—including a record eight senior majors.